From the Disney Minnie Mouse Bow-Tique Dream Party Supply Collection. 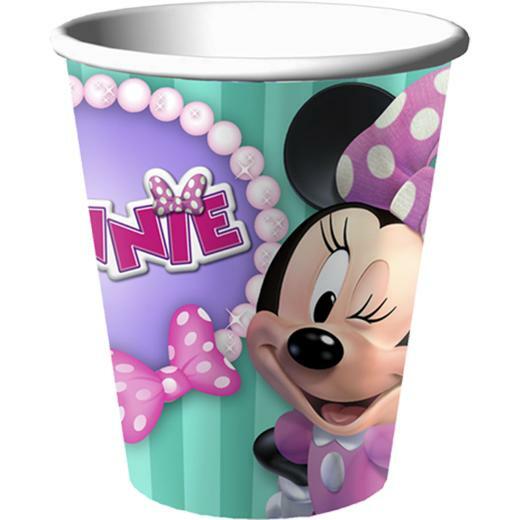 9 oz Disney Minnie Mouse Dream Party Cups. Features a winking Minnie next to a pearl necklace with pink polka dot bow, inside the pearl necklace reads "Minnie," all on a fun green striped background. Each package contains 8 adorable cups. Perfect for any Minnie Mouse themed party. See our full line of licensed Disney products. L: 6.0 in. W: 3.0 in. H: 3.0 in.